The foreign minister said Nicaragua has been the victim of an attempted coup backed by hegemonic forces, from which the country still suffers economically and socially. Oct 1 (teleSUR) Denis Ronaldo Moncada Colindres, the Minister of Foreign Affairs of Nicaragua spoke at the 73rd United Nations General Assembly Monday where he expressed his solidarity with Cuba and Venezuela and condemned the financial blockades and threats of military intervention by the U.S. while reiterating his country’s commitment to peace and denounced Washington’s interventionist policies. “The government and the Nicaraguan people defend the principle of sovereignty,” the minister said during his speech. He added that using economic sanctions is a coercive method adopted by the U.S. to change governments illegally which is unacceptable. This also takes away the sovereignty of the people, and the Nicaraguan government rejects this coercion. 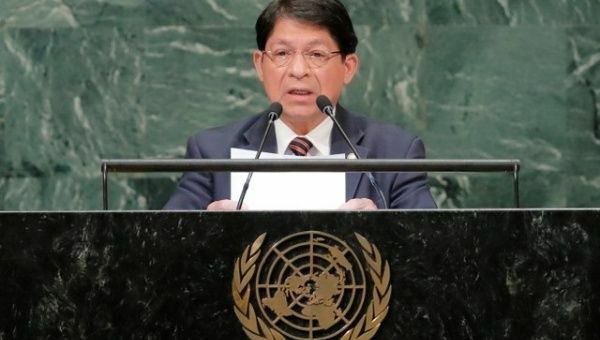 “We demand the cessation of any interventionist policy that violates international law with interventionist actions in Nicaragua and in sister nations,” he said. Expressing solidarity with Palestinians, he said, “Nicaragua pleads for the formation of the two states, the State of Palestine and Israel,” followed by expressing his solidarity with the people of Syria in the fight against terrorism. He added that “for Nicaragua to contribute to international peace is to achieve complete nuclear disarmament.” He also expressed his support for the denuclearization of the two Koreas. The minister highlighted the progress his country made including reduction of extreme poverty from 14.6 percent in 2009 to 6.9 percent in 2016. He also added that the country has worked in a sustained manner to achieve the objectives of the 2030 Agenda for Sustainable Development. He also stressed that “action is urgently needed to combat climate change” and that both his people and the Nicaraguan government advocate a world with values.